Storm Shadow Pop Culture Shock : 1/4 scale collectible statue of Storm Shadow, the G.I. Joe cartoon character. Manufactured by Pop Culture Shock. Sideshow and Pop Culture Shock Collectibles are proud to present the Storm Shadow 1/4 Scale Statue, joining your brigade of G.I. Joe collectibles. Inspired by his classic animated appearance, Storm Shadow measures 56 cm as he deftly climbs a Cobra-branded ATV embedded in the mud. The vehicle has a red missile launcher on top and is detailed with a number of decals and tallies of Cobra Command victories. 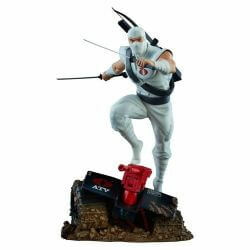 The Storm Shadow 1/4 Scale Statue features a sculpted white ninja costume, marked with a red Cobra symbol on his chest. His pristine costume is detailed with dynamic and realistic textures that give the appearance of active fabric. This skilled assassin is dual-wielding two katanas with a sheathed bow and arrows in the quiver on his back. Storm Shadow is painted with bold colors that blend his animated appearance with realistic dimension, creating a unique G.I. Joe collectible that practically leaps from animated show to your shelf. 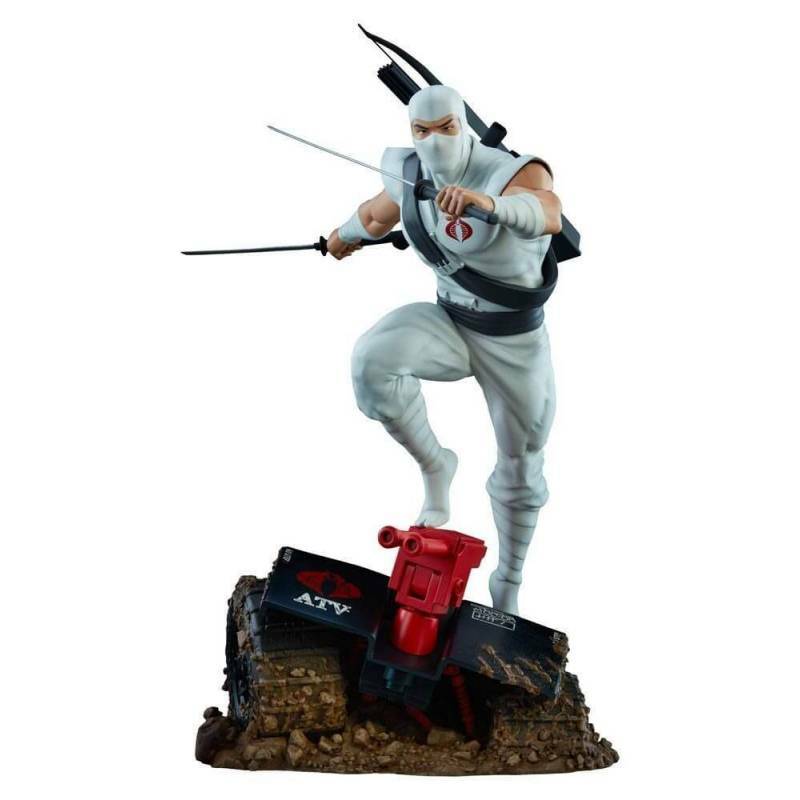 Harness the strength and speed of a deadly assassin and add the Storm Shadow 1/4 Scale Statue to your G.I. Joe collection today ! To see all our G.I. Joe statues and action figures : click here.